Straw bale gardening is an excellent solution for many gardeners around the world. It’s a smart, economical, flood-resistant way to grow veggies and other annuals right where you want them. 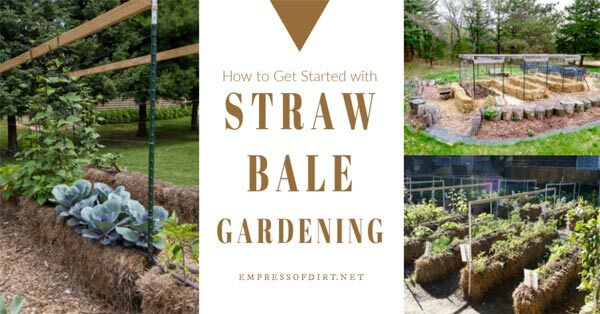 This information comes from Joel Karsten, the creator of this gardening method and author of several books including Straw Bale Solutions and Straw Bale Gardens Complete. If you prefer wood raised beds, this has information on the best wood to choose and there are free building plans here. 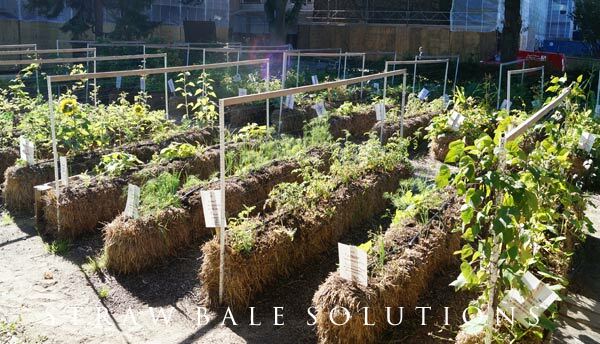 This article and images here are provided courtesy of Joel Karsten, author of the new book, Straw Bale Solutions: Creative Tips for Growing Vegetables in Bales at Home, and Quarto Publishing Group USA, Inc. who also provided a review copy of this book. 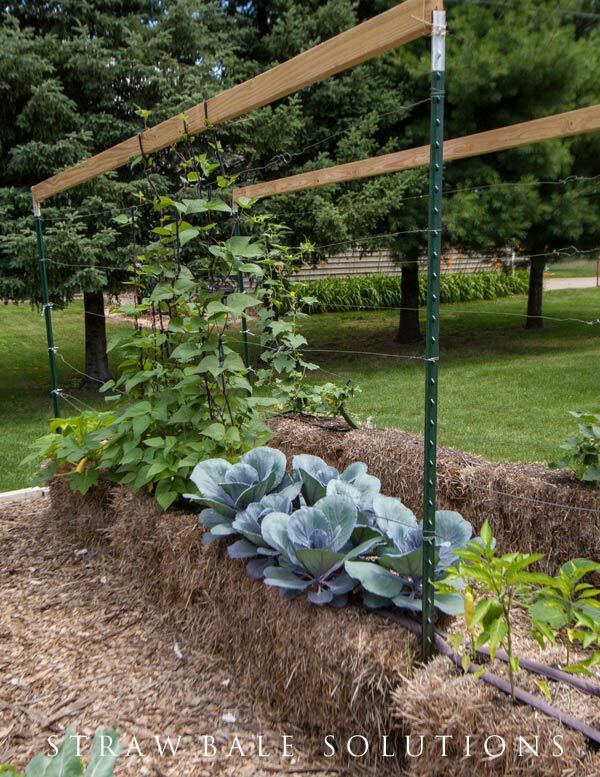 Straw bale gardening is an innovative way to grow veggies and other annuals. What started as a unique approach to gardening has spread around the world as growers realize the advantages over in-ground and raised bed growing. Very simply, straw bales are used as the foundation of the garden. The straw is first ‘conditioned’ to create best growing conditions, and plants are added. Add sunshine and water and you have yourself a beautiful, thriving garden. I’ve listed more of the advantages below. Here’s some veggie examples. You can also grow annual flowers. Straw is the stem of various types of small-grain cereal plants such as oats, wheat, rice, flax, rye, or barley. With the nutritious parts removed, we are left with straw-like stems that, when dry, have many uses such as bedding for animals, insulation, and mulch. Straw is golden in colour and animals do not show any interest in eating it. It would be like us eating cardboard. Hay is (usually) baled grass or alfalfa, green in colour, and feed for livestock. It is not recommended for straw bale gardening, although other organic materials such as leaves packed in bundles can work. Straw bales are tight bundles of straw, usually secured with thick twine. One straw bale (dry, not soaking wet) usually weighs around 50lbs. It’s raised bed gardening without the need to build raised beds or fill the beds with container soil. Straw bales are portable (when dry) and biodegradable (eventually), although they can last for several years. Like any taller raised beds, straw bales are easy to reach for those with mobility challenges. Straw bales are suitable where poor soil, drought, or low-level flooding prevents in-ground growing. The heat naturally-generated in the straw bales supports plant growth while prohibiting weeds. No need for crop rotation, and pest problems within bales are minimal or non-existent. First things first, nothing grows well in fresh straw! However, plants grow amazingly well in recently decomposed straw, so this is a key takeaway. Before planting straw bales, they must be “conditioned” which triggers (beneficial) decay. This is done by feeding the bacteria inside the bales. Don’t worry—it’s simple to do and there’s nothing gross about it. It’s all about creating an environment where things can grow and thrive. The conditioning process allows the bacteria to multiply rapidly and colonize the bales completely and quickly in about 10-15 days. These bacteria, along with insects, worms, mold, and fungi will then begin to metabolize the straw particles and break the stalks down into cells and the cells into molecules and the molecules into ions and cations, the fundamental building blocks of new life. These ions and cations of nitrogen, potassium, phosphorus, calcium, iron, zinc, manganese, sodium, molybdenum, magnesium, and more are all available nutrients then adsorbed through the roots of any new vegetables planted in the bales. The straw is breaking down into “soil” inside the bale and those same ions are again absorbed by the new plants to build new molecules, cells, and finally new stalks, leaves, seeds, etc. Mother Nature has been using the same ions to rebuild new living plants over and over again through ions of time. 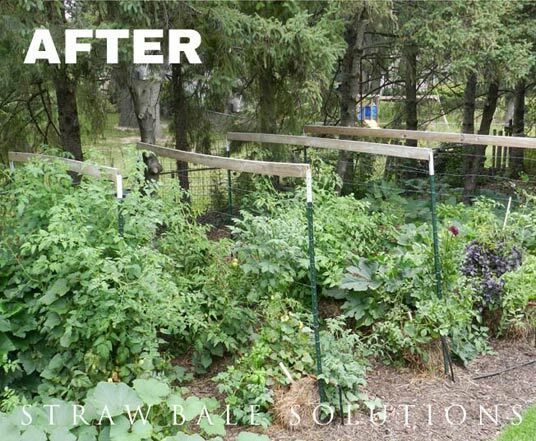 The biggest advantages of the STRAW BALE GARDENS® method come as a result of this amazing biological process. As the bacteria reproduce rapidly they vibrate, causing friction which dissipates as heat. This heat warms the bales and encourages root development of young seedlings. It also protects young plants from cold air temperatures when planting earlier than normal subject to late spring frosts, by generating a heat island around the bales. The quick decomposition of the organic material inside the bales causes any weed seeds to be cooked in the process and rendered inert and unable to sprout. This means a weed free bale, allowing most Straw Bale Gardener’s to go an entire season without pulling a weed from their vegetable garden. Because the “soil” being newly manufactured inside the bales is virgin soil, there are no lingering disease or insect issues that often harbor from year to year in traditional garden soil, so every garden gets a fresh start every spring without having to deal with problems of previous seasons. Also, no crop rotation is needed, since the “soil” is brand new underneath every plant anyway. The height of the bales allows more accessibility to garden for seniors, or anyone with a physical limitation which prevents them from easily getting down to ground level for planting and harvesting. Also provides good height and ease of use for anyone using a wheelchair. 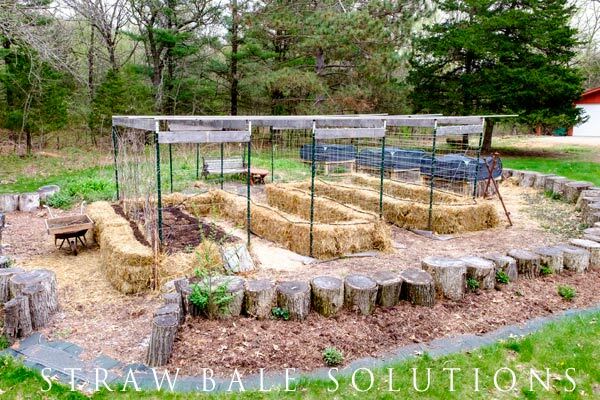 The cost is important for many, and it the low cost of straw bales (often $2 to $5 per bale here in Ontario, Canada) makes this method by far the least expensive method to start a raised bed garden. 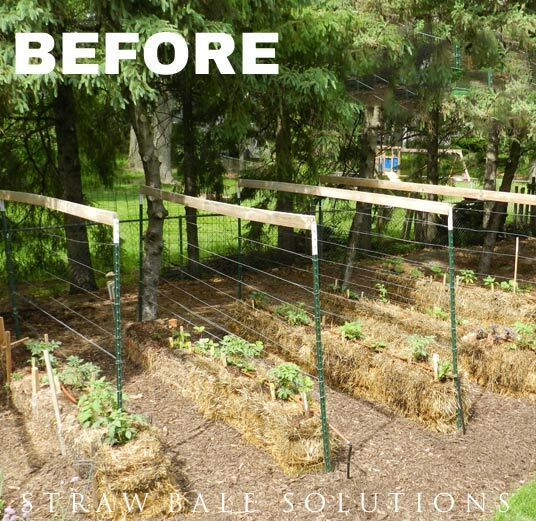 Without the need for expensive tools, equipment or soil modifications, the Straw Bale Gardens® method is really hard to beat. Watch out for designer straw bales! I have seen bales for sale in trendy shops for as much as $75. As mentioned, under $5 is often reasonable and realistic here in Ontario. If you do not know a farmer who sells them, ask friends, check local buy-and-sell ads, place a wanted ad, check Facebook groups, local garden nurseries, and farms. TIP: If you plan to transport straw bales with a car, bring large heavy-duty trash bags or tarps to wrap them first. Otherwise you will be removing pieces of straw from your car for weeks to come! Bonus if you can find straw from crops that have not been treated with pesticides and herbacides. Strawbalemarket.com: This is a directory of straw bales for sale in the United States. Joel has a Straw Bale Garden Club here where you can join in and ask questions. We ‘condition’ the bales to get them ready for planting. This takes approximately 10 days. To do this, we encourage bacterial growth in the bales (where the plant roots will grow) with nitrogen. Because there are so many plant combinations possible in straw bales, these instructions are generic to give you an overview. The books have much more detailed instructions. 1 Use traditional lawn fertilizer with a minimum of 20% Nitrogen content. For best results use ½ cup of the traditional lawn fertilizer on days 1, 3 and 5, then ¼ cup on days 7-9, with 1 cup of a standard balanced 10-10-10 on the 10th day. 2 Use Organic fertilizer with a minimum of 5% nitrogen (see product label). Organic fertilizers require higher volumes than traditional lawn fertilizers. For best results use 3 cups on days 1, 3 and 5, then 1 ½ cup on days 7-9 and one cup of an organic source of phosphorus and one cup of an organic potassium source on the 10th day. I do recommend getting Straw Bale Gardening Complete: Breakthrough Vegetable Gardening Method (2015) for detailed instructions. Moisture and warmth encourages bacteria to replicate rapidly. The ten-day conditioning process should include one gallon of water per bale each day during the process, NO MORE THAN ONE GALLON. This is a very common mistake and can slow the process, because water is cold this time of year, and the bacteria end up washing out of the bales if too much water is applied. The goal is to get the carbon/nitrogen ratio as close to 20/1 as possible. 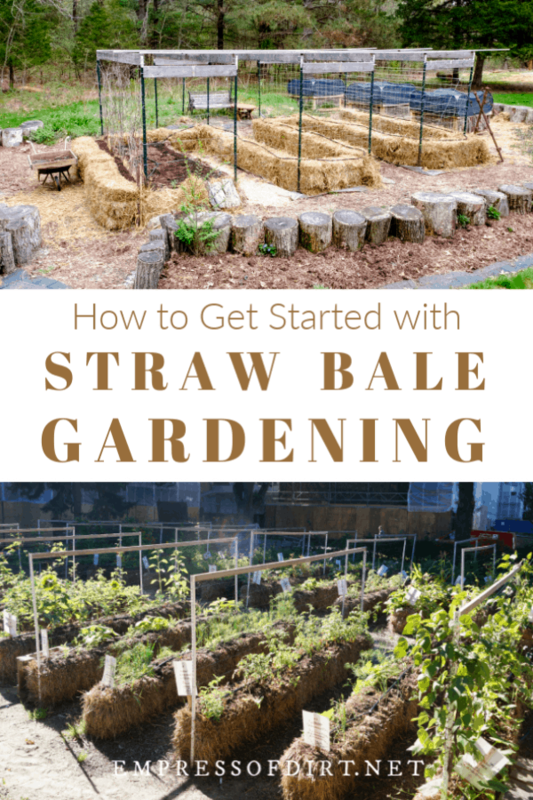 You won’t have a way of measuring this, but you’ll learn to recognize it as you become experienced with straw bale gardening and see how your plants do in various conditions. It’s similar to the look, feel, and smell or well-decomposed compost as it turns to soil. The addition of supports is a smart idea for climbing plants and anything like tomatoes that tends to get top-heavy. The newest book by Joel Karsten is Straw Bale Solutions and includes growing tips plus examples of straw bale gardens from around the world. I hope you will give this a try, and if you do, please let me know how it goes.